Filipinos were living in Louisiana as early as the 1750s and have been integral members of American society ever since. They have labored in Hawaii’s sugar cane plantations, picked vegetables in California, tended Washington’s strawberry fields, and worked in Alaska’s fish canneries. They now take care of the sick and elderly, educate America’s children, serve in the U.S. military, and help power commerce and industry. Filipinos are also the second-largest Asian group in the United States, below Chinese. Despite this long history in the United States and their considerable number, Filipinos remain politically invisible, particularly at the federal level. Only two members of Congress are of Filipino descent: Rep. Steve Austria of Ohio and Rep. Bobby Scott of Virginia. President Obama’s Asian American presidential appointees are predominantly of East and South Asian descent. This lack of representation at the highest levels hinders issues relevant to the Filipino-American community from surfacing and getting addressed. Ethnic community nonprofits can facilitate integration into the mainstream. Some strive to give their constituents political voice and power. A glance at Filipino-American organizations can help explain the group’s political invisibility. The National Center for Charitable Statistics identifies over 700 Filipino-American nonprofits, not counting regional associations and congregations that are not readily identifiable as Filipino. 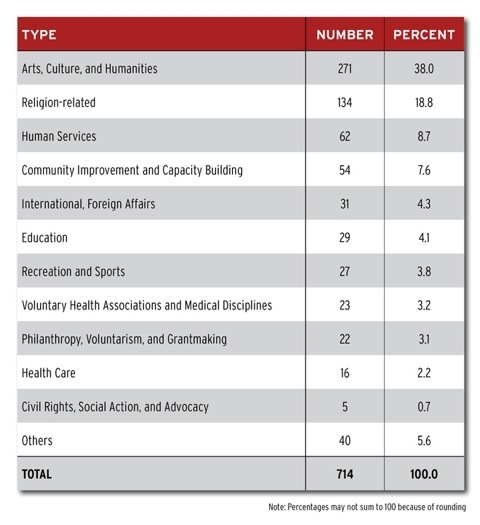 Four in ten are classified as arts and culture nonprofits and two in ten are faith-based. This comes as no surprise because many ethnic organizations foster awareness and maintenance of native culture. Filipino-Americans also tend to be religious and predominantly Roman Catholic. It is striking, however, that less than a percent of Filipino-American nonprofits are advocacy groups. These are the nonprofits that are vital to political participation and representation. This dearth, no doubt, contributes to the Filipino-American community’s lack of political presence and clout. While other factors can help explain Filipino-American political invisibility, it is worth the community’s time to take stock of their organizations and consider what more they can do to get their voices heard. "Only along for the ride" is the most common description heard about Filipinos' participation in mainstream political process. With little or no political contribution, good will seldom returns to our community. But not to worry, good things are waiting to happen to Filipinos in America that believe tomorrow will be better than yesterday.